Cloud computing has made inroads into the banking sector, but adoption has been slow. Owing to the sensitive nature of data, banks have been wary of adopting cloud solutions, especially public and hybrid clouds. But with the recent introduction of EU’s Payments Services Directives (PSD2), banks are more confident in incorporating cloud solutions into their core operations. The European Banking Authority has also issued an exhaustive guidance document for the use of cloud service providers by banks and other financial institutions. As banks recognize the potential of cloud computing their digital strategies are evolving to encompass cloud solutions. With multiple providers, a one-size-fits-all approach does not meet the requirements of this highly regulated industry. To meet the growing demands of the tech-savvy customer and facing stiff competition from Fintech, banks are looking to the cloud for improving their digital banking experience. But how can cloud enable superior digital banking? We take a look at cloud strategies to ease your cloud decisions. Digital transformation has helped banks offer innovative solutions to customers through mobile banking, chatbots etc. Most banks have relied on digitizing the front-end to revamp banking applications and providing the customer varied interaction touchpoints. But in the race to digitize their services, back-end or core applications of banks have remained relatively untouched. As we move deeper into the digital transformation era, the need of the hour for banks is to align their front-end initiatives with back office services. The major roadblock in this journey is the continued use of legacy systems. These monolith systems have to be upgraded or replaced to support computational and operational needs of the cloud. By integrating cloud solutions into core banking applications banks can look beyond the fluff of snazzy user interfaces to create a truly superior digital customer experience. For example, Temenos recently announced the launch of two new products – Temenos Infinity and Temenos T24 Transact, both designed for cloud-native and API-first technologies. By implementing cloud for front-end and core operations, the products can be deployed on-premise or in a customer/Temenos cloud. The cloud-agnostic solution can run on Microsoft Azure, AWS, and the Google Cloud platform. Typically, service providers deploy clouds either on a private, public or hybrid cloud. Private cloud infrastructure is a dedicated platform for a company to completely manage, maintain, operate, and secure its IT infrastructure. The ability to fully control access (physical and digital), deploy applications in minutes, and ensure security makes private cloud seem an ideal solution for financial institutions. The pain point of such a system is in achieving economies of scale. As a company expands, its servers have to scale accordingly, which can be a costly, time consuming, and labor-intensive process. Hybrid clouds offer the features of public and private clouds for running applications and enabling data portability. Hybrid clouds and multi-cloud strategies are quickly becoming the norm for banks and financial institutions owing to the flexibility, scalability, and minimal set-up costs. Leveraging best-of-breed services, hybrid/multi-cloud strategies avoid vendor lock-in and data sovereignty across applications. Both strategies help in de-risking business decisions and offer a greater choice of platform-agnostic services. 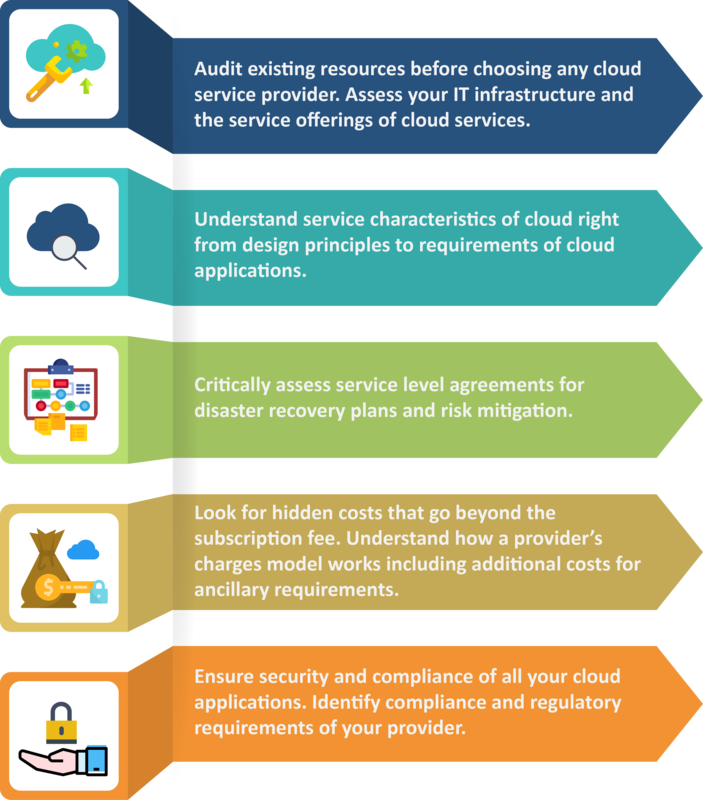 The pitfalls of a hybrid or multi-cloud adoption come with the hidden costs of every service. It’s easy to get lost trying to keep track of multiple cloud platforms and vendors. Deploying hybrid or multiple clouds would require complex and at times expensive IT infrastructure. Despite the challenges, banks are adopting hybrid cloud models to increase agility, quickly deliver application updates or new releases, and ease of scalability (upsize or downsize) based on enterprise requirements. Choosing the right digital cloud strategy can be a daunting task. In order to enable a superior digital banking experience, organizations need to enable a rapid shift to the cloud. Meanwhile, cloud strategies are evolving with new cloud service providers entering the market. With time and appropriate regulations, banks can accelerate their adoption of cloud solutions; choosing the best fit for their organizational needs.